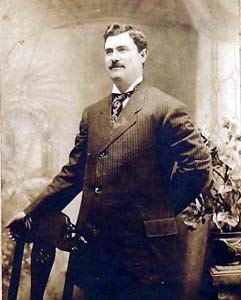 Catello LaMura married Carmela Lanzara in Castellammare di Stabia January 8, 1887. They had two children, Giuseppe and Concetta, before immigrating to New York in 1893. Carmela was only 21 years old, Giuseppe 4 1/2 years, and Concetta just 7 months. Traveling with them were Carmela's mother, Petronilla Lanzara, and Carmela's brother, 11-year-old Ciro. Petronilla and Ciro were listed in the ship's log under the name Bonifacio, Petronilla's maiden name. This was the custom at the time for women traveling without their husbands. Petronilla's husband, Giuseppe Lanzara, had made the voyage the previous year and would be waiting for them in Brooklyn. They traveled to New York aboard the S.S. Fulda. The voyage supposedly took 29 days in open steerage. Open steerage means they were on the ship’s lowest decks, just above the bilges, with no separate compartments. They arrived in New York Harbor on June 4, 1893, and processed through Ellis Island the next day. In what may have been an indication of the hard times that lay ahead for the immigrants, the New York Stock Exchange crashed three weeks after their arrival, on June 27. It was the beginning of a depression that would last for four years. Nonetheless, Catello and Carmela settled in the Red Hook section of Brooklyn, within view of the Statue of Liberty, and continued to raise their family. Catello found work as a barber. In the beginning, at least, he could neither read, write nor speak English. In July of 1894, another child was born. This was Rosa LaMura. Rosie has the distinction of being the first LaMura born in America. By 1900 they were living at 147 Conover Street, just up the street from Carmela's parents, Giuseppe and Petronilla Lanzara and Carmela's brother, Ciro Lanzaro, my grandfather, who lived at 135 Conover Street. On May 8, 1913, Catello submitted his Declaration of Intention to become an American citizen. He was 45 years old, dark complexion, stood 5 feet 11 inches (tall for that time) and weighed 196 pounds. He had black hair and brown eyes. At this time, he and his family were living with Ciro, Louisa and Petronilla at 91 Second Place in Brooklyn. He submitted his Petition for Naturalization on June 18, 1917. Now they were living at 514 Hicks Street in Brooklyn. On May 15, 1918, Catello became an American citizen. By 1920, Catello and Carmela bought their own house at 399 Clinton Street where all 7 of them shared the house with daughter Concetta, her husband Adolph Nori, and their 4 children. Somehow, the four adults and nine children survived living together in one house. Unfortunately, there is no photo of the house in the 1940 tax archives. It must have been demolished between 1920 and 1940. Here is the complete list of the children of Catello and Carmela, starting with Giuseppe and Concetta who were born in Italy. Giuseppe (Joseph) LaMura was born in Castellammare di Stabia on January 2, 1888. By the time he met and married Leona Emma Blanck in Brooklyn in 1917, he was 5 feet 8 inches tall, with brown eyes and dark brown hair, with a ruddy complexion. Leona was the daughter of German immigrants, Eugene and Emma (Behrens) Blanck. Eugene Blanck was born in Alsace-Lorraine, France in April of 1858. His parents were Johann Baptiste Blanck and Sophia Clara Krugell. Alsace-Lorraine was a German-speaking area of northeastern France, on the border with Germany. Emma Behrens was born in April of 1860 in Luxembourg, which was part of the Germany Empire at the time. Her parents were Otto Behrens and Agate Zaudar. Eugene and Emma emigrated from Germany to America in 1881. Although they arrived in the same year, I have no evidence that they did so together. They were married in Manhattan, New York on August 22, 1881. Leona was born in Brooklyn on September 27, 1890. The family lived at 993 Dekalb Avenue in the Bushwick section of Brooklyn. By 1940, the building no longer existed. Today, it is a park. For more information on the Blanck family, click here. Before she met Joseph, Leona had been married before, in 1907 when she was 16 years old, to Frederick Wenzel, and had two sons by him, Victor J. Wenzel and Frederick G. Wenzel. In 1910, they were living above a grocery store at 336 Central Avenue in Brooklyn. Emma was living with them, but Eugene was not. I have not been able to find out what happened to him. There is no record of his existence beyond 1900. Eventually, Leona and Frederick divorced. By 1917, Leona was living at 100 Stockton Street in Brooklyn, which is four miles east of Red Hook. This building no longer existed in 1940. Living with her were her two sons and her mother Emma. On July 18, 1917, Emma died from an infected ulcer. She was 57 years old. On December 27, 1917, 27-year-old Leona married 29-year-old Joseph. They continued living at 100 Stockton Street. In fact, their marriage certificate indicates that Joseph was already living there with Leona when they married. They had seven more children together. On January 7, 1918, Joseph and Leona's first child was born. This was Carmela LaMura. Living with them at the time were 10-year-old Fred and 8-year-old Victor Wenzel, Leona's two sons from her first marriage. Joseph was working as a motion pictures operator. Carmela, or Mel, grew up to marry Louis Pulcrano, Jr. on June 9, 1940 at the church of St. Mary of the Lake in Lakewood, NJ, where Lou's family was from. Lou was born March 4, 1916, the son of Louis Charles Pulcrano, Sr. and Concetta Giglio. Lou studied musical arrangement at Temple University and was employed by his Uncle Benjamin Pulcrano, a barber in Lakewood, at the time of the marriage. He also conducted an orchestra known as "The Vikings." During World War II, Lou served in the Army. Mel attended the New York Art and Fashion School and was employed by R. H. Macy & Company at the time of the marriage. Mel's uncle, Frank LaMura, said she was the "spitting image" of her grandmother, Carmela (Lanzaro) LaMura. Mel and Lou had a son and daughter. Mel and Lou died within two months of each other, Lou on October 22, 2006, and Mel on December 16. Joseph C. LaMura, Jr. was born April 15, 1920, in Brooklyn. On December 16, 1941, he joined the U.S. Marines and served 4 years during World War II, 3 years in the South Pacific. He received a Presidential Citation, along with his fellow marines, for their participation in the first invasion of U.S. forces at Guadalcanal. Before the war, Joe and his brothers formed a baseball team called "The Morganville Barons." They played other teams in the area, primarily those in Matawan, Keyport and Leonardo. The team disbanded in 1941 after nearly all of the players joined the armed forces to defend our country. After the war, Joe revived the team and became its manager. He recruited his brothers and other war veterans to play on the team. The Matawan High School baseball field became their home field. Eventually, they joined a semi-pro league and became the Matawan Barons. Joe's father took over management of the team. On August 3, 1946, Joe married Hazel D. Grothusen at St. Joseph's Catholic Church in Keyport, NJ. Hazel was from Keansburg, NJ and her date of birth is January 12, 1925. Her parents were Edward and Alvina Grothusen. Following their marriage, the couple lived temporarily with his parents on Tennent Road while Joe built their own house next door. Joe and Hazel have one son and four daughters. Joe was the Marlboro Township Tax Assessor for many years before his retirement in 1982. He received his New Jersey Tax Assessor Certification from Rutgers University. Joe was a life member of the Morganville Volunteer Fire Company and a charter member of the Morganville First Aid Squad. He was the first president of the Marlboro Township Little League which he helped start. He was a member of the Philip A. Reynolds Detachment, Marine Corps League, Freehold. For leisure time activities, Joe was an avid golfer, fisherman, hunter, and bowler. On June 16, 2013, Father's Day, Joe passed away at home at the age of 93. Like his brothers Richie, Frankie and Al, Joe was interred at the Brigadier General William C. Doyle Veterans Memorial Cemetery in Arneytown, NJ. Hazel was a real estate broker and operated Matchmaker Real Estate in Morganville, from 1975 until her passing at age 89 on July 28, 2014. Around 1922, Joseph Sr. and Leona moved from Brooklyn into the house where Joseph's parents had been living, on Tennent Road in Morganville, NJ. This was directly across the road from the farmhouse where Ciro Lanzaro was living with his family. Besides Carmela (Mel) and Joe Jr., Leona's two children from her previous marriage, Victor and Fred Wenzel, came with them. Joseph's parents, Catello and Carmela LaMura and their brood, moved down Tennent Road to a house near the train station, located next to what is now the Morganville First Aid Squad. Their son Mike attended and graduated Matawan High School during this time. Mike's other brother Frank had a job in New York. Each day he walked the short distance to the train station, took the 7:21 train to Matawan, then switched trains to New York. In 1922, Joseph Sr. and Leona were blessed with twins, Richard LaMura and Francis (Frank) Joseph LaMura, on August 11, 1922, at their home in Morganville. An All-Star athlete at Matawan High School 1937-1940, Frankie lettered in track, football and basketball all four years. He won the 100 yard dash at the Penn Relays in 1940 and soon after graduation enlisted in the United States Marine Corps. Joining the Marines on September 21, 1942, Frankie served with the 18th Battalion and sailed to the Pacific in June of 1944. By August 1944, he arrived in Saipan and moved to Tinian to establish the defense of Tinian Harbor. He fought in other major battles in the Pacific Theater. Frankie married Mary Lillian McMahon on May 31, 1948, at St. Rose of Lima Church in Freehold, NJ. Mary was born May 26, 1925. Her parents were James and Lillian McMahon, from Freehold. Mary's Maid of Honor was her sister, Peggy McMahon. Her attendants were Dorothy Sherlock (engaged to Frankie's twin brother, Richie), Frankie's sister, Leona LaMura, and Mrs. Andrew Juhacz of Jamesburg. Richie was his brother's best man, and his other brothers served as ushers. Frankie was active in harness racing for many years and co-owner of the Mount Pleasant Manor Nursing Home and Renaissance Residential Care Facility in Freneau, NJ. In the 1960's he and his brothers bought the old Poet's Inn Restaurant in Freneau and restored it to its original 1775 glory. Frankie and Mary had two daughters and one son. On February 7, 2009, Frankie died at the age of 86. He is interred at Brig. Gen. William C. Doyle Veterans Memorial Cemetery in Wrightstown, N.J. The other twin, Richie, joined the Marines during World War II with his twin brother on September 21, 1942. They served together in the Pacific battle against Japan. They arrived in Saipan in August 1944 and fought to establish the defense of Tinian Harbor. After the war, the twin brothers were hired by the Chicago Cubs as infielders, where they enjoyed a short but successful career. On June 19, 1948, Richie married Dorothy Sherlock, at St. Rose of Lima Church in Freehold, NJ, just three weeks after Frankie and Mary wed. Dorothy was born August 2, 1925 in Freehold, NJ. Her sister-in-law, Mary LaMura, was her matron of honor. Leona LaMura and Barbara VanPelt were bridesmaids. JoAnn Leach was the flower girl and Donald Wenzel the ring bearer. Richie's twin brother, Frankie, was best man. Following the wedding celebration, the newlyweds honeymooned in the Poconos. Dorothy's parents were Joseph and Ella Sherlock of Freehold. Dorothy was a Registered Nurse and the owner and operator of the Mount Pleasant Manor Nursing Home in Matawan. They had one son before Dorothy died on January 24, 1966. She was only 40 years old. She is buried at St. Joseph's Cemetery in Keyport, NJ. Richie remarried on November 29, 1969 to Lucille Maskal. Lucille was born July 29, 1941. They had one son and one daughter together. Richie died barely six months after his twin brother on July 31, 2009. He is interred along with Frankie at Brig. Gen. William C. Doyle Veterans Memorial Cemetery in Wrightstown, N.J.
Robert Eugene LaMura was born July 15, 1924. He served with the Navy Signal Corps during World War II and was a Radioman with the Pacific Fleet, serving aboard the USS Nassau aircraft carrier. He received several battle decorations. He was inducted by his shipmates into the Ancient Order of the Deep on August 31, 1944. After the war, Bob earned his law degree under the G.I. Bill of Rights from Seton Hall Law School, where he achieved distinction as a member of the Law Review and debating team, and as valedictorian of his class. He was admitted to practice before the U.S. Supreme Court and practiced law for many years in Matawan as a partner in the Offices of Applegate, LaMura & Horan and as a magistrate for several townships throughout Monmouth County. He also appeared before the New Jersey Supreme Court and was a member of the Monmouth County Bar Association. Bob married Elizabeth Ann Devlin on January 25, 1947, at St. Joseph's Catholic Church in Keyport, NJ. Elizabeth (Biz) was born January 2, 1926. Biz's father, Raphael C. Devlin, was Postmaster of Matawan, NJ. Her mother's name was Margaret Fury. In 1946, Biz graduated from the Perth Amboy Hospital School of Nursing and went on to work as a Registered Nurse. Mrs. Everett Carlson, Biz's sister, was Matron of Honor at the wedding, and Helen Crine Maid of Honor. Other bridal attendants were Biz's other sisters, Jean and Margaret Devlin, her cousin, Ann Moll, Bob's sister Leona. My father, Eugene Lanzaro, was best man. Following the wedding, the newlyweds honeymooned in the Berkshires. Bob and Biz had three sons and three daughters. Bob died on April 28, 2007 at The Lankenau Hospital near Philadelphia, PA. Biz passed on June 16, 2010. They are interred together in a mausoleum at St. Joseph's Cemetery in Keyport, NJ. Alfred Joseph LaMura was born November 7, 1926. Al graduated from Matawan High School in 1945. Upon his graduation he went into the United States Army and was stationed in Germany where he was secretary to the General transcribing court marshals and procuring housing for GI's. After the war, Al performed as a singer with the Walt Staeger Orchestra and was involved with Community Theater. He married Margaret Marie Taylor (Peggy) at the Freehold Reformed Church on September 6, 1952 in Freehold, NJ. Peggy, also known as Peg, was born in Neptune Township on March 7, 1933, the daughter of Mr. and Mrs. Wilbur Errickson of Englishtown, NJ. For the wedding, Marilyn Aumack of Englishtown, was maid of honor, Juanita Wolcott of Jamesburg was bridesmaid, while Nancy Heyer of Wickatunk was junior bridesmaid. Nancy's sister, Patricia Heyer, was the flower girl. Al's brother, Joseph LaMura, Jr., served as best man. The newlyweds honeymooned at Point Pleasant. Peg worked for the Marlboro Board of Education and sang with The Sweet Adelines. Both Al and Peg sang in the church choir. They have two sons and a daughter. Al worked in construction for many years and was a building inspector for Marlboro Township. He also served 3 terms on the Marlboro Board of Education and was a charter member of the Shrewsbury Coral. He retired from Damon G. Douglas Construction in 1988 and he and Peg eventually moved to Lake Placid, Florida. They were parishioners of Saint Francis of Assisi in Lake Placid for 15 years. Around 2011, they moved back to Freehold Township, NJ, and on March 22, 2012, Al passed away peacefully with his family by his side. He was interred at Brigadier General William C. Doyle Veterans Cemetery in Wrightstown, N.J. Four years later, Peg passed away peacefully on Friday, September 23, 2016 at home with her family by her side. Leona Marie LaMura was born June 9, 1928. In 1931, Leona's father took her to New York City to perform on the WJBL radio station, performing as Baby Leona LaMura of Morganville. At the time, Leona was less than three years old. Through the encouragement of her father, she had already made several stage appearances and won a number of prizes. She continued the venture and appeared regularly, every Thursday at 9 a.m., on radio station WLTH in Brooklyn with her father in the "Me and My Dad" program. Lou Cohen, a representative of Loew's Theater in New York City, drove all the way down to Morganville on August 30, 1933, to meet with Leona and her parents. Cohen had seen Leona perform the previous Saturday at the Strand Theater in Brooklyn where she sang "We're in the Money." On December 26, 1933, Baby Leona was one of the juvenile stars in a Happy Timers' Club party for 3,500 poor children of Brooklyn, in the Warner Strand Theater in Brooklyn. Leona wasn't the only family member to be promoted by her father. At a vaudeville show presented at the Strand Theater in Freehold, NJ, Joe entered the twins, Richie and Frankie, who were 13 years old at the time. They performed the songs, "Smilin' Thru" and "Home on the Range." When the American Legion of Matawan held their annual talent show at the high school on February 21, 1936, young (11 years) Bob LaMura won third prize in the Youngster's division. First prize was won, of course, by Baby Leona. In June of 1936, the Morganville Harmony Club, whose members included Eddie Koons and his daughter, Aletha, Art and Babe Phelan, Carmela (Toots) Lanzaro, Carmela LaMura, Joe and Leona LaMura, and their daughter "Baby Leona", named Baby Leona as the "Radio Star of Morganville." Leona married Robert C. Boyd on August 22, 1959 at St. Joseph's Church in Keyport, NJ. Bob was born May 13, 1926 in Lowell, Arkansas, the son of Charles Boyd. Leona's sister, Carmela Pulcrano, served as matron of honor, and her niece, 12-year-old Joene LaMura, was junior bridesmaid. Two other little nieces were flower girls: Maria LaMura and Joan Pulcrano. Leona's nephew, Alfred LaMura, was ring bearer. Bob served with the U.S. Navy in the South Pacific during World War II. Following his discharge from the Navy, Bob attended the Newark School of Fine and Industrial Arts, then became a sign painter with the Highway Advertising Company in Newark, and later for Gannett Sign Company in Lakewood, NJ. He was a member of the Marlboro Township Little League and also served on the board of directors. He was a den leader for the Cub Scouts in Marlboro, and a member of the Painters District Council 10 in Bloomfield. Leona attended Monmouth College and was teaching at a school in nearby Howell Township when they married. Bob and Leona had two sons. Bob died December 13, 1994 at home. He is buried at the Brigadier General William C. Doyle Memorial Cemetery in Wrightstown, NJ. On March 31, 2014, at the age of 85, Leona passed, at her home in Morganville. She was buried with Bob. By 1930, Catello had moved his family back to Brooklyn, to 324 Union Street, only a few blocks from their home in 1920. Now he was working as a "chemist" at a Dye Works company. Joe and Leona stayed in Morganville. 20-year-old Fred and 18-year-old Victor Wenzel were still living with them. By now, all the school-age children were sent to St. Joseph's Catholic school in Keyport, instead of the rustic schools they had been attending since moving to Morganville. Leona would drive them to school each day. On the way, she would drop her husband Joe at the Matawan train station so he could go to New York where he worked as an operator in a movie theater. Mel, Joe Jr., Richie and Frankie all graduated from St. Joseph's. Bob, Al and young Leona graduated from Morganville schools. When World War II broke out, the LaMura brothers volunteered to serve their country. As a result, Leona became a "5-star" mother. As if that wasn't enough, she also worked in the parachute manufacturing division of the Hightstown Rug Company in Hightstown, NJ. On June 1, 1962, 74-year-old Joe died at the Mount Pleasant Manor Nursing Home in Matawan. When Leona followed on September 5, 1974, three weeks before her 84th birthday, she left 35 grandchildren and 15 great-grandchildren. Joe and Leona are buried together in St. Joseph's cemetery in Keyport, NJ. Fred G. Wenzel, Leona's son by her first husband, was born in Brooklyn on May 20, 1909. He was working for stock brokers in New York when he married Rose Kostak in St. Joseph's Church in Keyport, NJ, on the Fourth of July in 1931. The occasion was also Rose's 21st birthday. Best man was Fred's brother Victor. Serving as the maid of honor was Mary Kabosky of South Amboy. Mary would one day marry Victor. Thirteen-year-old Carmela LaMura was a bridesmaid. Three-year-old Leona LaMura was the flower girl, while her brother, four-year-old Al was ring bearer. The newlyweds honeymooned in Canada. The daughter of Anthony Kostak and Mary Panciak of Matawan, Rose would one day serve as Matawan Township Clerk. Theu had two sons and one daughter. Fred and Rose were living in Clyde, North Carolina when she died in 2005. She was 95 years old. Ironically, she died on the same day in July, the fourth, that she was born and married. The following year, on February 23, 2006, 97-year-old Victor died. They were buried together at Crawford-Ray Memorial Gardens in Clyde. Victor J. Wenzel, Fred's brother, was born in Brooklyn on June 15, 1911. He moved to South Amboy in 1933. He was a bartender at the Poet's Inn in Matawan for many years, retiring in 1973. Prior to that, he was employed by the LaMura Construction Company in Matawan, owned by his step-brothers. He married Mary Kabosky. Mary was born on February 26, 1910, in South Amboy, New Jersey, the daughter of Andrew Kabosky and Mary Slezak. Victor and Mary had three daughters and one son. The son, Victor J. Wenzel, Jr., born March 18, 1934, died on May 13, 1994 in Rochester, Minnesota. Mary died on November 11, 1990. She was 80 years old. When Victor Sr. died on October 2, 1996 at the age of 85, he had 11 grandchildren and 12 great-grandchildren. He and Mary are buried together at Saint Mary Church Cemetery in South Amboy, NJ. Catello and Carmela's second child, Concetta LaMura was born in Italy on November 29, 1891. She came to America with her brother and parents, and on September 29, 1909, 17-year-old Concetta married 29-year-old Adolfo Nori. Adolfo, or Adolph, was born in Fano, Italy. I'm unsure of the exact date because there are different documented accounts. On his World War I Draft Registration card, it's listed as February 27, 1881. His World War II Draft Registration card says February 22, 1883. And the Social Security Death Index has April 18, 1880. In any case, his parents were Cesare Nori and Adelaide Centoscuri. Family lore suggests Cesare may have been a railroad engineer. Adolph arrived in America on February 26, 1898 when he was about 17 years old. By 1905 he was living with my grandparents, Ciro and Louisa Lanzaro, at 154 Conover Street in Brooklyn. I have no idea how he came to live with them. He was 23 years old and working as a "fireman" for John M. Donovan, a bottler of "mineral water", at 120 Summit Street in Brooklyn. By 1909, he moved with Ciro and Louisa to 91 Second Place in Brooklyn. Adolph and Concetta were married at The Sacred Hearts of Jesus and Mary Roman Catholic Church, located at 500 Hicks Street in Brooklyn. Ciro and Louisa were listed as witnesses on the marriage certificate. The newlyweds lived, for the time being, with Ciro and Louisa. By this time, Adolph was a business partner with Ciro and Concetta's father Catello in their own mineral water business, but he listed his occupation as "electrical engineer." Adolph and Concetta would soon move out on their own, but would change residences several times in the years to come. The baby she refers to is her second-born child, Adelaide Nori, who was seven weeks old when the letter was written. I don't know who "Cheala" is, perhaps her first daughter Carmela (Babe) Nori, who would have been three years old. "Noni" or Nonna, is the Italian word for "grandmother." "Gene" is Ciro who sometimes went by the name Eugene. Things must already be desperate down on the farm and Ciro has asked Adolph to find him work in Brooklyn, at least temporarily. I have no idea who "Torr" is, but I guess Ciro still rents the stable where they kept the horses for the soda wagons. "Joe" is almost certainly Concetta's older brother, Joseph LaMura. To see a copy of the actual letter, click here. Adolph described himself as being of medium height with a slender build. He had brown eyes and black hair. Linda LaMura McFadden, daughter of Frank and Gertrude LaMura, remembers Adolph as "The Chief." He smoked "crooked cigars" (I think she meant "culebra" cigars). He would come over to their house in Brooklyn where the men played passionate games of pinochle. Adolph had the habit of loudly slapping every winning card on the table. Linda says her father had a chicken farm in Madison, NJ before World War II and hired Adolph to run it for him. Years later, Adolph operated a big laundry business in New York, owned by Joe Spadaro, called Rex Laundry. It was at 2702 Stillwell Avenue on Coney Island, Brooklyn. Adolph once took my father there to show him how it worked. According to her granddaughter, Maryann, Concetta was devout and demanded good behavior and clean living from everyone in the family. She had very strong opinions and encouraged her daughters and granddaughters to achieve independence, something that she didn't have. She would cook for many hours to have a fully laden table ready for every Sunday afternoon following church. There was always plenty for the ever-growing family and for anyone else who happened by. Carmela Nori was born September 27, 1911. She was known to the family as "Babe." Her future husband, Arthur M. Phelan, was born in Jersey City, New Jersey, on November 27, 1907. Art was the son of William Campbell Phelan and Susan T. Maguire. William was born in Boston, Massachusetts on October 23, 1871. Susan was born in Ireland on April 4, 1878. She emigrated to America in 1884. Her father was Joseph Maguire. Around 1911, Art and his parents, plus his older brothers Ted and Bill, moved to a house on Tennent Road in Morganville, New Jersey. A few years later, my father and his family would move onto the farm in Morganville, close to the Phelans. Art's father was employed as a "mechanical draughtsman", later as an "office supplies merchant".. In the March 2, 1923 issue of the Matawan Journal, there was an article about Art's parents celebrating their 25th wedding anniversary at their house on Tennent Road. The party guests were entertained by "Lanzaro's Jazz Babies", furnishing "plenty of good wholesome music." Among the guests were Joseph Lanzaro, Michael LaMura, 19-year-old Annie LaMura, and 16-year-old Rose LaMura. Although the article doesn't name him, Art would have been 15 years old at the time. By 1930, young Art had become close friends with my father's brother, Larry Lanzaro, who was living with my father at the farmhouse. Uncle Larry and Art were the same age (born in 1907). According to Rich Phelan (Art's son), Larry brought Art to a party in Brooklyn where he met Babe. On April 23, 1934, 26-year-old Art and 22-year-old Babe were married, in Brooklyn. Art worked as an automobile mechanic. Prior to the marriage, Babe worked in New York as a long distance telephone operator for AT&T. She was an active Rosarian and member of the women’s auxiliary in Morganville where she and Art were instrumental in forming the Morganville First Aid Squad. Art was also treasurer of the Squad. Later, Art became an assistant foreman for the M. & T. Chemical Company in Matawan where he worked for 37 years. He was a vice-president with the International Brotherhood of Electrical Workers, local 1803. Babe and Art had two sons, Arthur M. Phelan, Richard L. Phelan, and one daughter, Susan Phelan. The oldest child, Arthur, was born in 1935; Richard, June 12, 1942; Susan, February 21, 1945 (one month after me). Susan and I were in the same class together from kindergarten into high school. Susan is married to Werner Tietjen. Richard married Blanca Delgado in Texas on December 18, 1965. They have two children: Richard Elliott Phelan and Stephanie Marie Phelan. Arthur married a woman named Barbara. For some reason, my family and the Phelans were never close socially, although we lived near one another. I vaguely remember my parents mentioning something about a dog being shot and Rich Phelan told me he remembers the story that my grandfather Ciro, who the Phelans called "Lanzie" shot their dog for some long-forgotten reason. I do know that Ciro was notoriously ill-tempered, so the possibility that he would shoot someone's dog is believable. Art's father, William C. Phelan, who was born in Boston, Massachusetts on October 23, 1871, died at the Phelan home in Morganville on August 7, 1934 at the age of 62. According to the Federal Census records, William worked as a "mechanical draughtsman", and an "office supplies merchant". Art's mother, Susan, was 77 and still living at the home in Morganville in 1951. She was at her son Ted's home in nearby Matawan when she died June 27, 1951. She was born Susan T. Maguire in Ireland on April 4, 1878. She immigrated to America in 1884. Susan and William are buried together at Old Tennent Cemetery in Tennent, NJ. In July of 1961, the family left Morganville and moved to the nearby town of Matawan. Babe and Art were living at 281 Broad Street in Matawan when he died there at the age of 62, on January 8, 1970. He was buried with his parents at Old Tennent Cemetery. In July of 1994, Richard stopped in to visit my father. He was living in California with his wife, Blanca, and two teenage daughters who were with him when he visited Dad. He said his mother, Babe, was still alive and living in Princeton. His brother, Arthur, lived in Princeton before moving to Virginia, and Susan somewhere in northern New Jersey. Just recently I learned of the death of Babe, on September 4, 2010, three weeks before her 99th birthday. She was living in East Hanover, NJ, and was buried at Gate of Heaven Cemetery in East Hanover. Adelaide Nori, born July 13, 1914. She was 22 years old when she married 40-year-old Charles Edwin Ward, a widower, in the Church of St. John The Evangelist on 21st Street in Brooklyn on December 19, 1936. Charles was born in Brooklyn on October 8, 1896, the son of Charles Decker Ward and Agnes Ward. The elder Charles, born in New York in September of 1862, was a deck hand on a tug boat in New York Harbor. According to his granddaughter, Maryann Ward Downs, her father described him as "Popeye", only taller. He had strong muscular arms and upper torso, with a lean lower body. Agnes was born in England in October of 1866. Adelaide and Charles lived at 773 58th Street in Brooklyn. Charles worked as a boiler inspector for the Kings County Lighting Company. He had a son from his first marriage, Charles Edwin Ward, Jr., born July 29, 1929. Little Charles was only 10 days old when his mother, Minnie Jaeger Ward, passed away. Charles and Adelaide also had a daughter, Maryann Ward, born September 17, 1939. Charles Sr. was a veteran of World War I, having seen action in the Ypres and Somme Offensives, and the battles of Dickebusch Lake and Schirpenburg. He was gassed with chlorine gas and had use of only one lung the rest of his life. He was discharged from the Army April 2, 1919. Despite his injuries, he also served in the Army during the Second World War, in the Reserves. Adelaide was essentially a homemaker who helped supplement the family income with jobs at A&P, Woolworths and various small businesses in the neighborhood. She was also active in the Girl Scouts and several civic organizations. Charles retired in 1960 from the Brooklyn Union Gas Company where he worked with the service department. In 1968, Adelaide and Charles moved from Brooklyn to 6 Newbury Circle in Howell, New Jersey. Charles died on December 6, 1974 from the effects of Chronic Obstructive Pulmonary Disease (COPD). On June 19, 1979, Adelaide, who was suffering from Lymphatic Cancer, passed away. She is buried at St. Charles Cemetery in Farmingdale, Long Island. Charles E. Ward, Jr. enlisted in the Army in 1941. He served during the Korean War and retired after more than 20 years in the service. He held the rank of Sergeant Major (retired) at the time of his death in 2010 in San Antonio, Texas. Anthony (Tony) Nori, born August 28, 1915. By this time, Adolph and Concetta were living in a tenement at 228 Degraw Street in Brooklyn, which has since been torn down. They and the children, Carmela, Adelaide and Tony, shared the tenement with three other families, including 18 other children. Tony dropped out of high school after his freshman year. He worked odd jobs until he enlisted in the Army on March 3, 1942. His unit was part of the Army that crossed the Rhine in World War II. At the time of his enlistment, he was 5 feet 10 inches tall and weighed 162 pounds, and he was married. According to Linda LaMura McFadden, he was "drop dead gorgeous." Women threw themselves at him and he married a pretty but empty-headed girl who liked to party. She remembers hearing him in her family's living room trying to sort out his problems with "Uncle Frank." Her father, Frank P. LaMura, was the family "Godfather", but honest and fair in his judgments. He always believed in controlling anger and talking things through. Tony had no luck with women, according to Linda, and his second marriage was no more rewarding than his first. By the time the war ended, Frank had bought a beautiful house on Brooklyn Heights and transformed it into a multi-rental property. Frank hired Tony as part of his "crew." The renovations seemed to take forever, according to Linda. She remembers tracking plaster dust to high school. According to Adelaide Nori's daughter, Maryann, Tony was a wonderful craftsman who worked on the project of building housing at the newly designated Plattsburgh Air Force Base in upper New York State, during the 1950's. While working on the project, Tony met Bertha P. Garrant, his third and final wife. Bertha was born in Plattsburg, New York on August 31, 1920, the daughter of Arthur and Jennie Garrant. After his work ended on the Seaway, Tony and Bertha moved to California. Their marriage was happy and fruitful, producing two sons. Then, suddenly, Bertha discovered she had cancer, which quickly spread, and she died at the age of 43, on May 11, 1964, leaving Tony with two boys aged 7 and 8 to raise alone. To make this tragedy even worse, shortly before his wife's death, Tony injured his back working in heavy construction for a California company. When he finally got to a doctor just after his wife's funeral, the news was horrible. He, too, had a cancer growing on his spine. The doctor asked if he had family that could care for the boys, told him to take his sons back east, that he did not have long to live. The doctor also recommended a "new" treatment offered at the VA clinic in Brooklyn. They had begun bombarding tumors with Cobalt. He brought the boys back to New York, put them in school and began his treatments. Linda LaMura McFadden remembers Tony telling her father in one of their many talks, "Uncle Frank, I am getting so discouraged waiting to die." Her father said, "Well, son, perhaps you should consider forgetting about it. Just go out there and live." The cobalt treatments stopped the growth of the cancer, never cured it. But Tony lived, instead of dying, in the six months he had been given. In fact, he lived almost ten years, long enough for his boys to get through high school and go out on their own. Tony died November 23, 1975. He was 60 years old. He is buried at St. Charles Cemetery in Farmingdale, Long Island. Adolph Nori, Jr., born in 1917; died of tuberculosis, October 29, 1930, age 13 years. He is buried at Holy Cross Cemetery in Brooklyn, in the same plot as Emma Blanck, the mother of Leona Blanck LaMura, and Loretta Silano LaMura, Michael LaMura's first wife. Joseph Nori, born September 7, 1919. Baby Joseph developed pneumonia on his first birthday and died just four days later on September 11, 1920. He is buried in the LaMura family plot at Holy Cross Cemetery in Brooklyn. By this time (1920) they were all living together with Concetta's parents and her remaining younger siblings at 399 Clinton Street in Brooklyn. Adolph had just obtained American citizenship and was working as an "engineer" at the docks in Red Hook. There were four more children: Joseph (Joe) Nori, born around 1921, Robert (Bob) Nori, born around 1923, Frances Nori, born August 21, 1925, and Mary Nori, born December 5, 1929. In 1925, they were all living at 345 Hoyt Street in Brooklyn. By 1930 they had moved yet again to 451 Degraw Street in Brooklyn. On the 1940 Federal Census, their address is listed as 332 19th Street in Brooklyn. Just two years later, 59-year-old Adolph registered for the draft, as he was required to do by law, and listed his address as 855 58th Street in Brooklyn. By this time, he was working at Rex Laundry on Coney Island. During World War II, Tony, Joe and Bob served in the Armed Forces. Bob was a prisoner of war at Stalag 17 for 13 months when the B17 he was a crew member of, crash landed behind enemy lines. For more on his story, click here. Joe and Tony were based in England. Towards the end of the war, Joe met and married Alys Patricia Rance, in England. Alys was born in Bracknell, England on August 29, 1922. According to Joe, she had been called Peggy all her life. It seems the midwife who delivered her said she looked like a "sweet little Peggy" when she was born and her family adopted that nickname. Also, she was named after her paternal grandmother whose name was Alice, but her mother used the Welsh version which was Alys. She was a World War Two veteran who packed parachutes in support of the Battle of Britain in 1940, when she was 18 years old. The marriage took place in England three weeks after the end of World War Two in Europe, on May 26, 1945. Joe and Alys had two sons and one daughter. Shortly after her 93rd birthday, Alys passed away on August 31, 2015. Bob married Marge Benelli. Marge was born April 21, 1927. She passed away on February 29, 2012 at the age of 84. On November 25, 2017, at the age of 94, Bob passed away. Frances married John J. Adisano. John was born in Brooklyn on July 18, 1927, the son of Charles Adisano (1899-1982) and Delia Foti (1901-1991). He served with the Army in World War II. On March 5, 1984, two years after the death of his father, John died. He was only 54 years old. Frances died November 13, 2008 at the age of 80. They are buried together at Calverton National Cemetery on Long Island, New York. Mary, whose real name was Mary Immaculate Conception, married Robert Williams. Robert was born in Runnemede, New Jersey. They lived in Plattsburgh, New York and had five children. They were twins Michael Thomas and Mark Timothy, Karen Eileen (deceased April 1, 1989) Kevin Andrew, and Kelly Marie. Robert died around 2013. Mary still lives in Plattsburgh. Adolph died May 23,1963 when he was 83 years old. Concetta was 85 when she died on August 9, 1977. They are buried together at St. Charles Catholic Cemetery in Farmingdale, Long Island. Rosa LaMura, "Rosie" was born in July of 1894, and was the first LaMura born in the U.S.A. Sadly, just before her 12th birthday, she died of typhoid fever on June 2, 1906, during the typhoid epidemic that swept through New York City and Long Island at that time. The epidemic was blamed on one woman, Mary Mallon, better known as "Typhoid Mary." Rosie was the first to be buried at the LaMura family plot in Holy Cross Cemetery, in Brooklyn. Their oldest son, Arnold J. Mastellone, born February 15, 1922, served in the Army in the European Campaign during World War II. After the war, Arnold became an engineer with the New York Telephone Company, where he worked for 32 years before retiring in 1981. In 1946, he married Della Buccolo. Della was born October 5, 1924. They had a son and two daughters. Arnold was also a member of St. Mary's Roman Catholic Church Memorial Hall, where he was a Eucharist minister and usher at Sunday noon Mass for more than 30 years. He was also a communicant of St. Dominic's Roman Catholic Church in Brick, a charter member, Grand Knight and fourth degree member of the Vince Lombardi Knights of Columbus in Leonardo, NJ, and a Faithful Navigator of the Bishop McFaul Knights of Columbus in Long Branch. And he was a member of the Middletown, NJ Elks. Arnold died September 22, 2000 in Brick, NJ. He is buried at St. Joseph's Cemetery in Keyport. The other son, Charles A. Mastellone, Jr., born August 25, 1925, married Stella Esposito on June 18, 1949. Stella was born September 14, 1928. They had two daughters and one son. Charles died January 6, 2010. He is buried at Greenwood Cemetery in Brooklyn. Sadly, Charles and Stella's grandson, Charles Mastellone IV, informed me Stella passed away on October 1, 2016. She was 88 years old. She was laid to rest in Greenwood with Charles Jr.
Millie and Charlie's daughter, Margaret Mastellone, born March 8, 1927, married James Lookretis. James was born June 9, 1926. They had three sons. James died March 20, 1996. Frank P. LaMura, born March 19, 1902. When he was only 17 years old, he had a job as a real estate agent. Five years later, he married Gertrude Trail on October 8, 1925. Gertrude was born March 19, 1900. They shared the same birthday. Her parents were Edward Trail and Gertrude Johnson. She was working as a stenographer when they married. They lived at 422 Clinton Avenue in Brooklyn. Living with them in 1930 was Gertrude's widowed father, Edward, who was originally from Maryland. Edward worked as a supervisor for a retail store in Brooklyn. According to Frank's son Edward LaMura, Catello had a very successful bottling plant in Brooklyn. It supplied glass bottled soda and beer to departing ships. Eventually, the cost for new bottles had a bad effect on the business. Frank and Gertrude attempted to save it with a product they called "Click" ginger ale, but that proved to be a bad business venture. They would eventually close the business. Gertrude (Judy) LaMura was born in Brooklyn on March 25, 1927. She married Mortimer Steinhauser in 1952. Mort was born in Portland, Oregon on September 19, 1922, the son of Charles Steinhauser and Edna Cantoni. Mort served with the U. S. Marines during World War II. He worked for Agway as a propane specialist until his retirement in 1987, after 24 years. Following retirement, he started his own business, Steinhauser Inc. He was a member and vestry member of Calvary Episcopal Church, a 50-year member of the National Propane Gas Association (NPGA) and the "Ancient Gassers", a member of the Marine Corps League, Veterans of Foreign Wars (VFW), and the Disabled American Veterans (DAV). In 1986, he received the National Propane Gas Safety award. Judy worked in New York City prior to her marriage. Early in the marriage, they moved to Bainbridge, New York, where Judy was active in community theater and the League Of Women Voters. Eventually, they moved to Homer, New York where she became a co-founder and Treasurer of the Homer Children's Center and an active member of the Homer Episcopal Church. Mort and Judy had two sons and a daughter. On May 7, 1995, Mort died at the hospital in nearby Cortland, New York, at the age of 72. Judy was 80 when she died on August 10, 2007. They are buried together at Glenwood Cemetery in Homer. Sandra LaMura was born in Brooklyn in 1933. She married John P. Bruggemann in 1956. John was born in Brooklyn on January 19, 1926. They have a son and daughter. On January 14, 2001, John died just 5 days before his 75th birthday. Linda Ann LaMura was born in Brooklyn on August 29, 1934. She married John McFadden on June 9, 1956. Linda and John have five sons and two daughters. Most of the information about the LaMura ancestry in Italy is taken from a letter that Linda's father Frank wrote to his niece Carmela (Mel) LaMura Pulcrano in the 1970's. In 2013, Linda published a book titled "Dawn In A Timid Sky." She used the information from Frank's letter to create a wonderful novel that weaves a partially-historic saga about life in 19th-Century Italy. Linda was 79 years old when the book was published. She also wrote another book, "Where's Sylvia? The Story of an American Child Lost in Nazi Germany". To view a copy of the actual letter that Frank wrote, click here. Edward LaMura was born in Brooklyn on November 30, 1936. He married Aileen Fox in 1961. Aileen was born November 18, 1939 in the Bronx, then moved to Syracuse, New York with her family. Edward was an officer in the U.S. Army Corps of Engineers and was stationed in France. When they returned to America after living for two years in France, Aileen taught school in a Brooklyn Country Day school in the Bay Ridge section of Brooklyn. She then went to law school and passed the Bar in New York and New Jersey. She rose to be a partner in a Wall Street Admiralty firm. She worked as an administrative judge for the New York City Taxi and Limousine Commission, from which she retired. When Edward returned from France, he became an architect and is still practicing in New York. They have two sons: Ted LaMura has a position with Verizon, and Kevin LaMura works for the Debevoise & Plimpton law firm, as the manager for their Associate program. By 1940, Frank, Gertrude and the children were living at 107 St. James Place in Brooklyn. Frank was still working in real estate. Frank later worked for the New York Housing Authority. Around 1976, he and Gertude retired to Florida. He died in Florida on the Fourth of July in 1983 when he was 81 years old. He is buried at Holy Cross Cemetery in Brooklyn. Gertrude died on December 1, 2000. She was 100 years and 9 months old. Anna LaMura, born March 17, 1905. While only 16 years of age, Ann worked as an examiner for a mercantile store. She married Santo (Harry) Calarino. Harry was born May 4, 1900. They had one daughter and two sons. The first son, Vincent A. Calarino, was born October 12, 1924, in Morganville, probably at the home of either Anna's brother Joseph and his wife Leona, or her parents, Catello and Carmela LaMura, who lived in Morganville for a few years around this time. Vinnie married Marcia Rosen in 1958 and they had a daughter and a son. Vinnie was employed by the New York Post Office for nine years and was a member of the New York Letter Carriers Union. He was also a veteran of World War II. According to Maryann Ward Downs, Vinnie was a colorful character who wore zoot suits during the 1940's. Vinnie and Marcia and the children had just moved from Brooklyn to the Winston Park section of Howell Township, New Jersey, when Vinnie died on September 12, 1969, exactly one month before his 45th birthday. He is buried at Ocean County Memorial Park in Toms River, New Jersey. Ann and Harry's daughter, Angela Calarino, was born September 28, 1927, but, tragically died on March 3, 1944 when she was only 16, possibly due to an infected tooth. Young Leona LaMura remembers her as being very pretty. She is buried at St. John's Cemetery in Middle Village, Queens. The third son, Richard Calarino, was born March 27, 1931. Richie and his brother Vinnie worked for their Uncle Mike LaMura when they were teenagers. Richie married Elizabeth Lopergalo in Brooklyn in 1951. They have one daughter and two sons. While living in Brooklyn, Richie worked for a furniture manufacturer in New York City and in 1952, was drafted into the Korean War, where he served as a Corporal until the end of the war, December 1953. He was in the 8th Army, Company B, 14th Engineers Combat Battalion. He returned to the factory after the war. The family moved to Englishtown, New Jersey, around 1967. The lived not far from Wayne LaMura and his wife Reine. Richie continued working, doing re-upholstery, hanging draperies, shades and other window treatments. During the 1930's and 40's, Harry and Ann and the children lived at 712 Union Street in Brooklyn. At some point, Ann and Harry divorced and Ann remarried, to George Serrao. George was a Merchant Marine. When Ann died in December 1965, she was buried in the LaMura family plot at Holy Cross Cemetery in Brooklyn. The name listed in the cemetery records is Anna Serrao. Harry was 89 when he died in Brooklyn in February of 1990. Rose Theresa LaMura, "Aunt Reggie", was born in Brooklyn on September 13, 1907. In 1929, when she was 21 years old, Reggie married a 29-year-old jeweler named Alfred De Feo, known as "Fred". Fred was born in Brooklyn around 1901. Initially, the couple lived in an apartment building at 2325 Foster Avenue in the Flatbush section of Brooklyn. In 1931, their only child, a son named Carmine Anthony De Feo, known as "Sonny", was born. By 1935, they had moved to another apartment building at 465 68th Street in the Bay Ridge section of Brooklyn. Maryann Ward Downs remembers when she was 5 years old, Sonny and cousin Richie Calarino, who were both 13, were walking down the street when they saw her coming from the other direction. They called out "Hey, good lookin', what's cookin?" She put her hands on her hips and did a little shake, and replied "Soup droop". According to Maryann, the boys found this to be hilarious and fell down from laughing so hard. Reggie was 77 years old and living in Orange County, California when she died there on December 5, 1984. Michael K. LaMura, born December 10, 1909. He was known as Mike to some, Uncle Mickey to others. He married his first wife, Loretta Silano on November 20, 1932 at The Sacred Hearts of Jesus and Mary Church, located at 500 Hicks Street in Brooklyn. Loretta was born September 19, 1911. Her parents were Ralph Silano and Carolina Palumbo. Like everyone else during the Great Depression, Mike and Loretta struggled to make ends meet. They had a baby girl named Marie LaMura, born in 1933. In 1934, Loretta became very ill and Mike brought her all the way from Brooklyn to the home of his brother and sister-in-law, Joseph and Leona LaMura, who were living in Morganville, NJ. Leona tried to care for her but eventually they had to take her to South Amboy Hospital. Knowing the end was near, Leona drove from the house in Morganville with little Marie and Leona's daughter, also named Leona, to the hospital. They arrived in the hospital parking lot where Mike came running out to tell them they were too late. Loretta died on July 27, 1934. She was only 22 years old. She was buried at Holy Cross Cemetery in Brooklyn. Little Leona, who was six years old at the time, remembers Loretta as a beautiful woman. Baby Marie went to live with Millie and her husband, Charlie Mastellone. On October 23, 1937, Mike married his second wife, Gertrude Horn. Gertrude was born November 20, 1915. Her parents were Samuel Horn, born 1895 in Lodz, Poland (Russia), and Rose Reisman, born 1898 in Hungary. Samuel died in Manhattan in November 1959. Rose died in New Jersey in 1982. Mike and Gertrude had two sons and one daughter. The first son was Wayne Richard LaMura, born in Brooklyn on February 19, 1940. He served as a Lieutenant in the U.S. Navy Air Corps from 1962-1966 and afterwards became an airline pilot. He married Reine Franchitti in Cannes, France on September 6, 1963. Reine was born December 19, 1943. They have one son and one daughter. Wayne married a second time, to Maria Eugenia Fajardo-Souffront, in Coconut Grove, Florida, on October 11, 1975. Maria was born June 5, 1947. Mike and Gertrude's daughter, Sharon Barbara LaMura, was born May 24, 1943 in Brooklyn. She married Raymond Mario Muscari in Spring Valley, NY on her 21st birthday in 1964. Raymond was born November 9, 1940. They have one son and one daughter. Mike and Gertrude's second son, Gregory George LaMura, was born in Brooklyn on January 22, 1949. He married Pamela Shuler in Plantation, Florida, and they have two daughters. Gregory died in Hendersonville, Tennessee at the age of 45 on May 5, 1994. Mike was a natural comedian and performed professionally as a musician and comedian. He also owned a hardware store in Dumont, NJ. Mike was 75 years old and living in Florida when he died on October 12, 1985. He is also buried at Holy Cross Cemetery. Gertrude died in Hendersonville, Tennessee on the Fourth of July, 1996, when she was 80 years old. She is interred at Springhill Cemetery in Madison, Tennessee. Carmela died in her home at 397 Union Street in Brooklyn on December 14, 1930. Catello died there November 9, 1943. They are buried together in the LaMura family plot at Holy Cross Cemetery in Brooklyn.